Heat oil in a pan. Add mustard seeds, cumin seeds, pinch of asafoetida and curry leaves. Add chopped onion and saute till it turns translucent. Add tomato cubes and saute for 4-5 minutes. Tomatoes should get mashed up with onions. Add red chili powder, turmeric powder, coriander powder, cumin powder, goda masala and salt to taste. Saute till oil starts to separate from spices. Add eggplant cubes, tamarind pulp, jaggery and little water. Mix well and cover the pan. Let it cook for 8-10 minutes. Keep stirring in between. Finally add roasted peanut powder and chopped cilantro. Let it simmer on low heat for 5 minutes. Serve hot with chapati or rice. All your recipes are very good and well presented. Well done on this one too! Nice side dish to rotis, I like the addition of peanuts.. 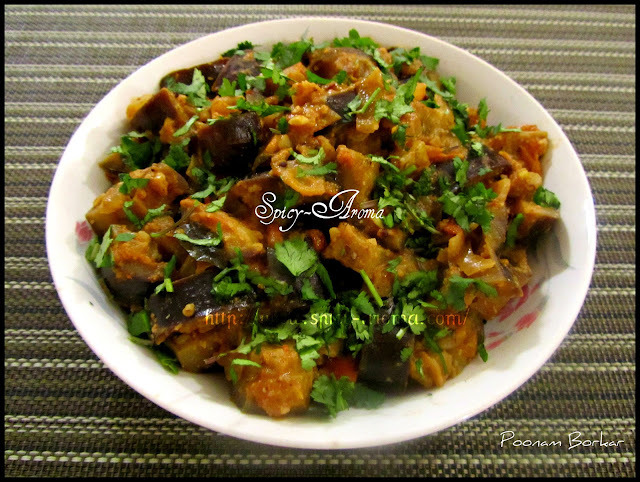 I love eggplant and your one is too tasty.... love the goda masala I think it gives a special flavor and magical taste to the dish!